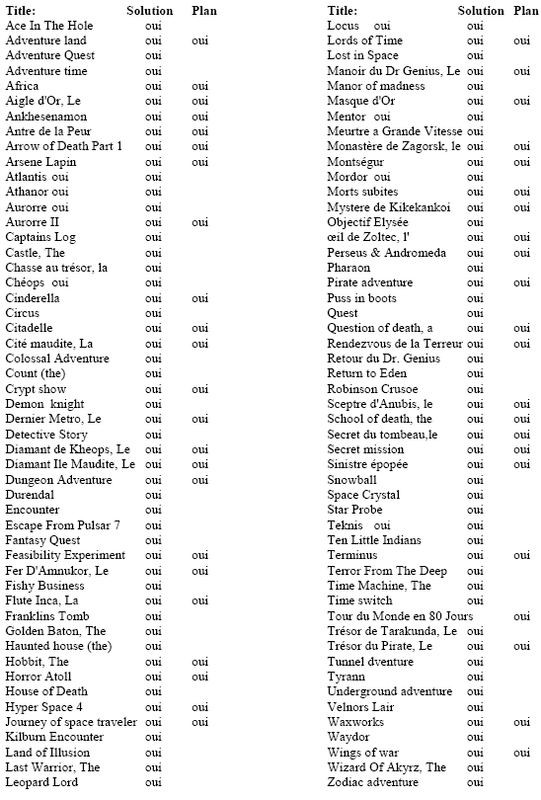 Dom50, on the CEO forums, is trying to make a complete list of all adventure games for Oric and of their solutions and maps. If you don't read French, you should learn it. Ahem no that's not what I wanted to say, I meant you can just look at the pictures that I link here. Tevrog's Kingdom II (1983)(Cable Software). If you have solutions, map and/or tap/dsk that you want to add to this list please post here. 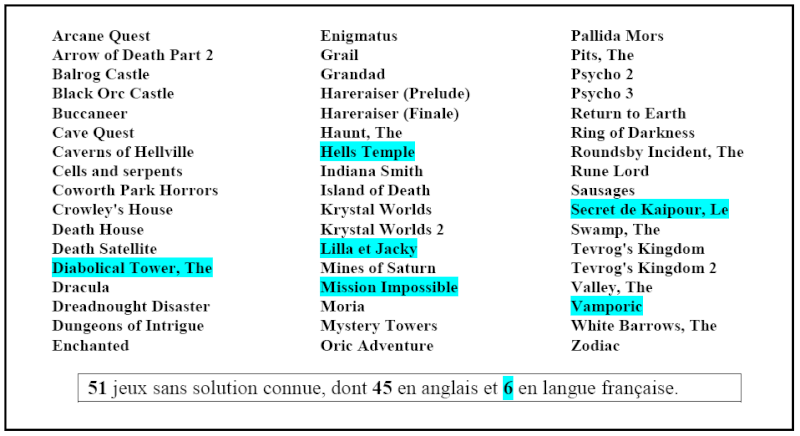 Here is a list of Infocom games which should be compatible with Pinforic:- Zork 1, 2 & 3 , Ballyhoo , Cutthroats , Deadline , Enchanter , Hitch Hiker's Guide To The Galaxy , Hollywood Hijinx , Infidel , Leather Goddesses Of Phobos , Lurking Horror , Moonmist , Planetfall , Plundered Hearts , Seastalker , Sorcerer , Spellbreaker , Starcross , Stationfall , Suspect , Suspended , Wishbringer , Witness. Look in the Infocom section. And in the Swedish Archive there are dsk versions, if I am not mistaken. Can't remember for sure, though. I've just taken a look at the readme file and the process is easy if you have a 3,5 DD, as you can make the common step (format, copy the dat file) and then create a disk image (with dd or WinImage or something similar). But nowadays this is not the usual case... But there surely are tools for creating/managing virtual floppies (i.e. disk images). Not sure if Crowley's House is different from Pallida Mors which was, I believe by the same author. It was a type-in I did from Oric Computing. I think it is on a OUM disk. I think the pages said Cowarth Park Horrors. It should be different. These were available on tape. I think I have the master disk for Enchanted. OUM may have printed a solution(?) I should have Sausages and Grandad on tape. Getting these on to PC is the problem for me at the moment. Hi all. It seems the Oric Swedish Archive is down or something. No more games for downloading there, including all the Infocom dsk images. Hakan is going to refresh his website. May be he'll put these archives later. However, i should have a backup and able to upgrade oric.org. I was looking forward those disk images with the Infocom adventures mainly. I may have a copy somewhere. They are MSDOS disks with the .dat game file as only file after formatting which Pinforic can read. Easy to do on a PC with MSDOS and a 720 FDD. Creating the image was easy IIRC with Linux (a matter of using dd, I thinkg) but required some program on MSDOS. Not sure how many of these there are but I've got 20 of them. Let me know if there's any you're after.